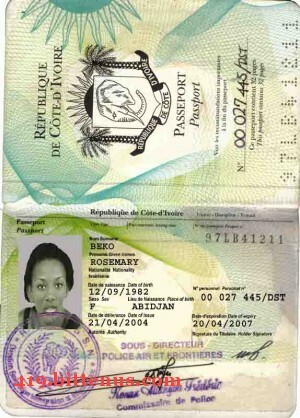 Ms Rosemary Beko says: "The money is not a drug money or money laundring"
Hello, I am Miss Young. This story I received from R.T. He received a letter from the daughter of a cocoa merchant that was poisoned to death. Go to the homepage to see more stories. I am Ms Rosemary Beko the only daughter of late Chief.and Mrs. Dikko Beko. My father was a very wealthy Coccoa merchant in Abidjan, the economic capital of Ivory coast, my father was poisoned to death by his business associates on one of their outings on a business trip . My mother died when I was a baby and since then my father took me so special. Before the death of my father on October 2004 in a private hospital here in Abidjan he secretly called me on his bed side and told me that he has the sum of (Seven million, five hundred thousand United State Dollars).USD($7.500, 000, 00) left in fixed / suspense account in one of the prime bank here in Abidjan, that he used my name as his only daughter for the next of Kin in depositing of the fund. He also explained to me that it was because of this wealth that he was poisoned by his business associates. That I should seek for a foreign partner in a country of my choice where I will transfer this money and use it for investment purpose such as real estate or hotel management. (3) To make arrangement for me to come over to your country to further my education and also to secure a resident permit in your country. Moreover, Dear I am willing to offer you 15% of the total sum as compensation for your effort/ input after the successful transfer of this fund into your nominated account overseas. Furthermore, Dear please indicate your options towards assisting me as I believe that this transaction would be conclude within seven (7) days you signify your interest to assist me. Anticipating to hear from you urgently. Greeting and best wishes to you this day. How is your family? My happiness for your email message. I understood your email with open heart. 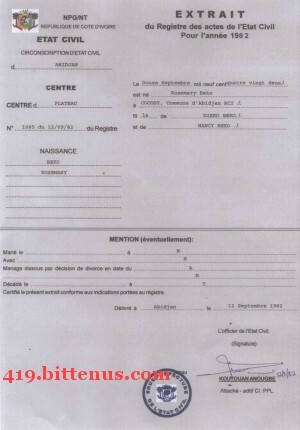 I would like to respond to your message immediately as this is a matter that needs urgent attention and I want you to always remember the fact that my life is in danger here in Abidjan Cote D'Ivoire, West Africa, due to the enemies that poisoned my father as they are hunting for my life to kill in other to tarnish my father's image and also to seat on this money that is why I am worried to transfer the money abroad. 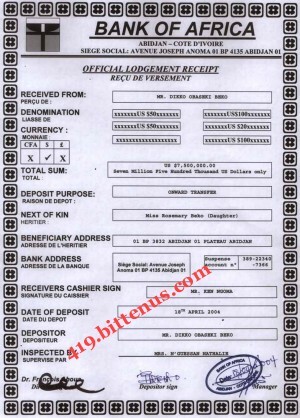 Dearest R.T., I appreciate your readiness to assist me, I am an orphan that needs your assistance to transfer my inheritance from Africa to your country to get a better life and permanent future. The money is not a drug money or money laundring, my late father was during his days a wealthy cocoa merchant that operated in this sub-region as an exporter of Cocoa and Coffee, though he was poisoned by his business associates out of wickedness and jealousy. This is why I want to leave Africa to be protected under your care till such a time that I am grown enough to face the business that you will negociate for me. Dearest R.T., my beloved father seriously warned me never to involve any person of African origin in this transaction because of the circumstances surrounding his untimely death. This transaction is therefore very confidential between you and me untill you confirm the money in your account for security reasons. I wish to assure you that this money is in a bank where my late father deposited it and I have the documents covering the money in the bank and I can send them to you for your view because seeing is believing. Above all, all the processes involved in the transfer of this fund shall be very transparent and legal because this money is my only hope to survive so I cannot afford to make any mistake in the transfer process. Dearest R.T., I promise to offer you 15% of the total amount as compensation for your assistance, and another 5% to cover any cost of expenses which you will incure in this transaction, while the remaining 80% will be for me which shall be use for investment according to your advice because I will continue my educational carrier as soon as I come over to your country. Please send me your full legal names and address, private telephone and fax numbers, for easy communication and also to enable me fax you the documents covering the money in the bank. I shall go to the bank to inform them of my readiness to transfer the money to your would-be nominated bank account. Please I will appreciate if you could give me a break down on the kind of investment opportunities in an around your country as I rely so much on your advice in this regard. Please find attached copy of my photograph, copy of my international passport, my father's death certificate, and the official lodgement slip issued to my father on the day of the deposit. These documents I send to you in confidence and trust, and would want you to keep them confidential. Nobody knows about this transaction except you and I, so you should keep everything confidential between us,until the fund gets to your account. I expect to recieve your personal details as requested above. Dearest R.T., my father was a known cocoa merchant in this country. He was one of the big exporters of cocoa produce in this country. Please send me your personal details and banking details to enable me open discussions with the bank in regards to the transfer. I require your full legal names and address, phone and fax numbers, and a scanned copy of your photograph and identithy. I would want you to understand the need for urgency in this matter, please get back to me as soon as possible. R.T. asked them to forward an advance payment to his bank to show that it was not a scam. He never heard from them again. 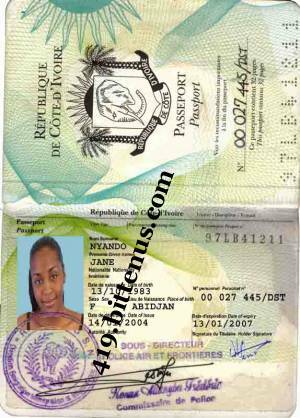 The pictures the scammers used, show Genevieve Nnaji, a Nigerian actress.